Me too Brandi. Thank you so much. Wish Tupe was still awake. His middle name is Daniel & he has a daughter born in 2002. Ex is Shellie. I posted her marriage license and signature above and requested that maybe we want to change the thread name to correct it. You have to change each post? I was just suggesting the thread name change. YW. I think getting the name right is important for the victim. Muffy, thanks! That was a lot of work! A security camera caught a missing mother of three's black Hummer last Thursday afternoon, the day she was last seen. At 3:18 p.m., video showed Parker's black Hummer H3 coming and going from Smith's condo, where she dropped off her children. A large sticker advertising Parker's mobile tanning business is seen in the video. Nearly a hour and a half later, the Hummer left the neighborhood on South Goldenrod Road. The sticker appears to have been removed. So she stayed at Dale's condo for an hour and a half when she dropped off the twins? And she drove up with the sticker on her car, and when the car left, the sticker had been removed. The article is now gone! You have requested a page that cannot be found. We have recently migrated our site to a new platform, which is why old links may no longer work. Please use the navigation or search box above to guide you to your desired content. Also, if you've bookmarked the page and it's not working, please email the link to web@clickorlando.com. I think they took the article down. I heard that the video of the Hummer leaving with no sticker on it may have been a different Hummer. Yep, I agree, there's a good chance they took the article down. I've seen it happen before. I kind of took the article another way. At 3:18 the video showed the Hummer coming AND going from Dales. An hour and 1/2 later it left the neighborhood. Like for an hour and 1/2 the vehicle was still in the neighborhood vicinity. It's been almost one week and there is still no sign of missing mother of three Michelle Parker. An eyewitness claims she saw Parker's Hummer parked at an apartment complex as early as Thursday night, which was 24 hours before it was found on Friday afternoon. Orlando police are working with the Florida Department of Law Enforcement on the case. They are keeping the information they've gathered to themselves. It's unclear how much they're sharing with the volunteers who are going out and searching for the missing mother. I wonder how close the Walden Palms condos are to Dales condo? 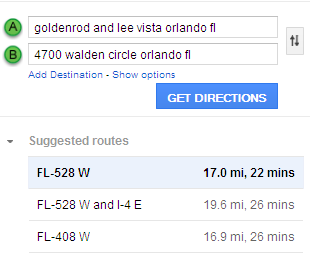 goldenrod and lee vista is where Dale's condo is. 4700 walden circle is where the Hummer was found. Quoted to correct my post. I don't think she watched the show at Dale's with him. According to her sister, her plan was to drop the twins off, go back home and nap since she had to work that evening. I think she would make a point to be home when her son came home from school, around 3:30. From all accounts she's a good mother and put her kids first. Sure looks like him, cartfly.